Christmas is right around the corner and with that all the excitement that thrills everyone. This includes our cats. They love the smells and all the new shiny things and will participate in every thing that appeals to a cat. There are some hazards that are not always evident at this time of year. With a little forethought and preparation we can avoid these issues and just have fun. Let’s have a look at some common elements in almost every home. 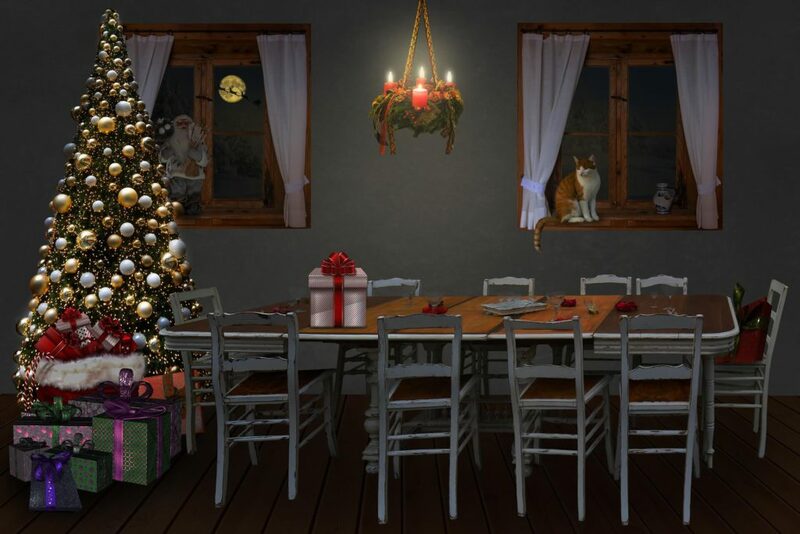 We all love a beautifully decorated tree and so do our kitties. The natural tree is beautiful and smells nice, however it drops needles which are dangerous and can be lethal if swallowed by our cats. I recommend cleaning up dropped needles regularly. 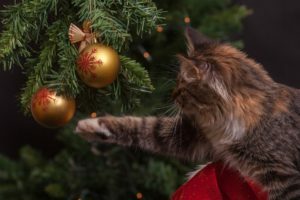 The water that the tree sits could be contaminated by pine oils, fertilizers, or fire retardants which are poisonous to your pets. If necessary cover the water bowl for your tree with tin foil. A sturdy stand is necessary especially if your kitty might try climbing the tree. It maybe necessary to tether the tree to the wall. Regarding decorations we used to hang small stuffed animals on our tree to avoid anything that might be broken such as glass bulbs. Any ornament that was hung was generally unbreakable. We quit using tinsel or garlands that could be a choking or bowl obstruction hazard. With eight cats now we do not put up a tree. These trees are a nice alternative, but they shed needles as well. These will be an aluminum needle probably and will be a health hazard if ingested. If these trees come pre-decorated the ornaments should be checked to see how fragile they are. An inspection of the stand is necessary to see how topple proof the tree is. Electrical cords might be a chewing problem if your cat does such things. It might be best to unplug the tree if no one is present. Any device with batteries should have the batteries disposed of properly when changed. Button batteries will burn the inside of the kitty or child if ingested. Be careful. 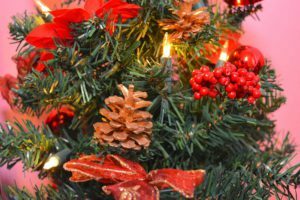 There are many plants that come into our homes during the Christmas season. 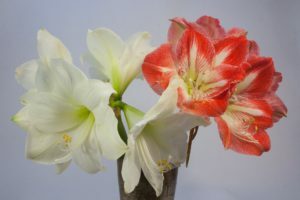 The Poinsettia, Holly, Mistletoe, Lilies, Daffodils, Amaryllis and the Christmas Cactus are toxic to cats and dogs. 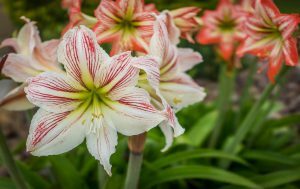 The Lilies and the Amaryllis are particularly lethal and should be kept away from pets. A nicely wrapped present is lovely to look at. My cats love to scratch boxes. I am sure that a present with ribbons and bows will hard to ignore for any kitty. Sometimes for reasons I can not explain they will pee on things. With these things in mind it might be better not to put the presents out until it is necessary. During this busy time of the season lots of people might be in attendance. With that some pets might be overwhelmed by all the traffic. It might be best to isolate the kitties or puppies from people until things are more relaxed. Guest with small children must be instructed not to rough house your cats. Guest coats should be put in a separate room to avoid something getting peed on. This could be brought on by the odors of other cats and dogs brought in on different clothing. We have fed our cats and dogs before our big meal and this has reduced the cat traffic at the table. In fact even with eight cats and two dogs we have had very little trouble with pets at the table. During any festive season the kitchen is a hub of activity. Chefs are busy and the action and smells of this time makes our cats want to take part. We must be careful not to let our cats jump on the counter or stove to prevent burnt feet or injuries. I always put a pot of water on an open element so that it can cool down. I could not imagine what a paw would look like after stepping on the stove. Accidents can happen when we are the busiest. 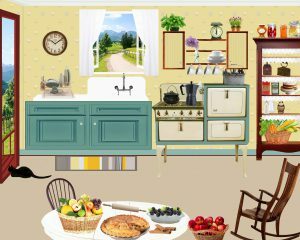 With lots of traffic between cupboards and stoves watch that you do not trip over the cat. This is when its nice to have help or put the pets in another room until your work is done. One of the most common causes of kitchen fires is unattended cooking. If you need a rest shut the top of the stove off or have someone watch for you. As humans we can eat many things that are not healthy for our cats. Turkey is typical offering at this time of year. Turkey is not hazardous in its self unless it is too hot. It is the additional things we put on the turkey that can give upset your cats stomach. Butter, oils, stuffing and spices may not agree with you kitty. Onions must not be given to cats or dogs in any form. N-propyl disulfide is the compound in onions that will damage the red blood cells and their ability to carry oxygen. Chocolate has an ingredient called theobromine(similar to caffeine) that is extremely toxic to cats. It can be fatal. Raw bread dough can make your cat very sick. The yeast can cause bloating from the production of carbon dioxide and produce alcohol. The alcohol produced can cause drops in blood sugar, blood pressure and body temperature. Raw eggs used during baking can cause salmonella infection or E.coli. The cautions here are necessary so that your can spend your time celebrating rather than be at the vet for an expensive after hours doctor visit. Any wrapping such as aluminum foil, plastics and wax paper can be very seductive to a hungry cat. These items if swallowed will need a vet visit. The most dangerous item I see is greasy string. If ingested it might wrap around something inside the cat and MUST NOT be pulled. This requires medical attention! If there is string hanging out of your cats bum you could cut it off and then hope it passes. All food wrapping should be disposed off immediately. What Magnificence is the Cat. For us cat lovers this is an easy choice, however to give a cat as a gift is a big decision. Cats have been dumped after the thrill wears off. This is a crime. When considering a cat, dog or bunny as a gift this decision must be thought out ahead of time and everyone must be on the same page. The saying goes, you can have a clean house or a pet – not both. My cats are family and my home is their home and we live together. Just to clarify, my house is clean because we work at it and it’s WORTH IT. For this reason not everyone can tolerate a pet in the house. When writing an article like this I try to cover a lot of ground. Every one knows their cats and most things we do anyway. Perhaps for a new pet owner this should be informative. It is no different from preparing your home for that crawling toddler. A little time spent being careful is way easier than being at the vet. I wish everyone a Great Christmas season and for those that don’t celebrate this time of year every blessing to you too. 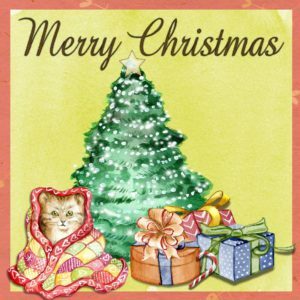 Don’t forget to check my Cat Care Products page and pick out a nice present for that special kitty. Here is a nice cat bed. Please click on the image for pricing and more options. 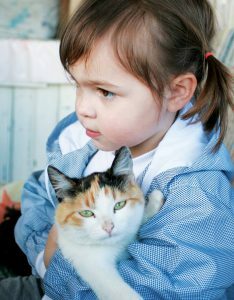 Now hug a kitty and do something green for the environment. As a responsible pet owner every member of our family requires regular medical care. Your veterinarian is your first point of contact. The veterinarian is a highly trained and compassionate individual. That’s why becoming a veterinarian is a noble occupation, a necessary public service. Becoming a vet begins with a passion for animals. If my vets did not have the same compassion for my pets as I do they would not be my doctors. A veterinarian is a Doctor Of Veterinary Medicine that has six years of training at a university and is licensed to provide medical, dental and surgical care for animals. It should be noted that as a DVM the work is not all cute and cuddly. There will some messy days and it must be necessary to overcome the messy part of the business. Remember the rewards are priceless. Should you be fortunate enough to still be in high school you can prepare by selecting courses in science. Science courses in biology, chemistry and physics will give you a foundation to build on as you undertake post secondary education. Other disciplines to consider and depending on how you want to specialize will include courses in the humanities, social sciences, mathematics and business administration/management. Practical experience can be gained by volunteering at an animal shelter or veterinary clinic. Experience with several animal species is helpful. Be sure to maintain a list of references for future applications. This next paragraph is Canadian oriented, however an internet search or a session with a guidance counselor should answer any questions you may have to suit your local situation. 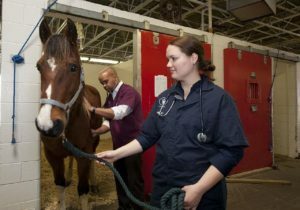 Obtaining a Doctor Of Veterinary Medicine (DVM) in Canada will require two years of pre-veterinary study at a regular university. Then four years of study at one of the five Canadian veterinary colleges. In order to practice veterinary medicine in Canada you will need a license. This will be obtained in the province where you chose to work. In the field of human medicine there are specialists. Its is the same for veterinarians. Here are some options. In this field a veterinarian works with companion animals and services a local community. Patients can include dogs, cats, reptiles, birds and small mammals. Other services may include a broad spectrum of pet care and counseling, including wellness, preventative medicine and late stage life education. Other courses that this practice requires are surgical, dental and alternative medical procedures. These facilities are regularly inspected and must comply with a high standard. Most facilities equipped with laboratories, x-ray equipment, surgical facilities and pharmacies. They will have proper kennels and may provide 24 hour care. In Canada this is the largest employment group in veterinary medicine. This practice includes small, large and mixed animal care Vets in private practice manage their own business and treat and maintain various animals with current recommended techniques and procedures. Veterinarians in private practice ensure healthy maintenance among farm and companion animals. Large animal practice as the name suggests encompasses the group of large livestock including poultry. Medical services include diagnostic and treatment of individual animals and herd maintenance. The mixed animal practice encompasses both large animals and companion animals. This practice is common in rural areas and will provide comprehensive medical and surgical service. 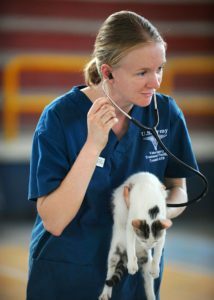 I personally use a clinic like this and I think that this type of practice provides a new DVM extensive life experience. 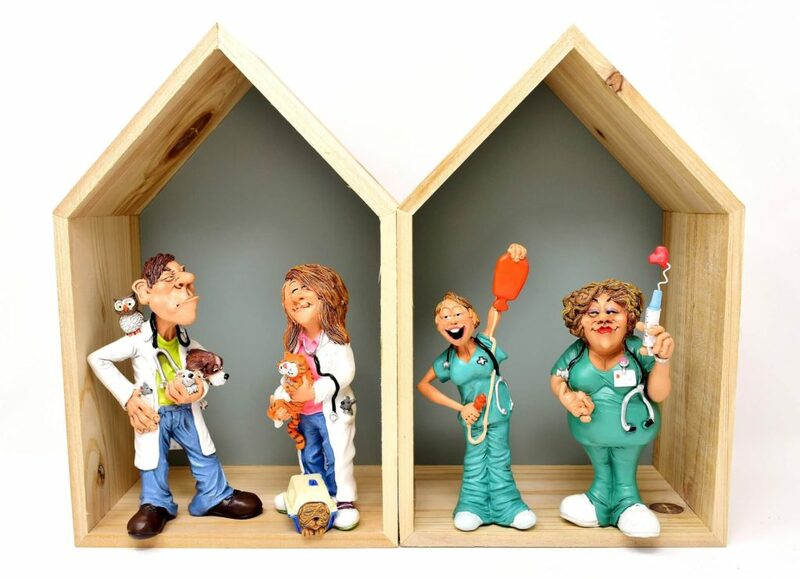 Some examples of a veterinary specialist are: cardiology, dermatology, neurology, ophthalmology, oncology, behavior specialist, internal medicine, dentistry, and anesthesiology. There are also species specialists which focus on felines, equine, bovine or a zoo specialist. 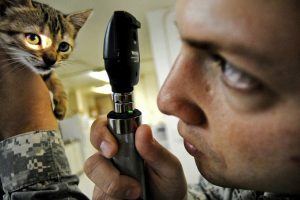 Additional study is required after achieving a DVM to be considered a specialist. Then a board certification is necessary. The American College of Veterinary Medicine and the American Board of Veterinary Practitioners are examples of boards registering specialists. A RVT works under the supervision of a DVM. Training for a career as a RVT requires up to three years of college education at an approved educational facility. In Canada this will be from a Canadian Veterinary Medical Association or the Ontario Association of Veterinary Technicians accredited program. It will necessary to complete the Veterinary Technician National Examination. Upon graduation employment may be found in private practices, zoos or wildlife rehabilitation facilities. Research laboratories also hire RVT graduates. This discussion on becoming a veterinarian is Canadian oriented. Please contact your career counselor or search for a university in your area. If you need any help please leave a comment below. Becoming a DVM or RVT requires dedication and study and this will provide you with spectacular career. I really believe that this profession is a necessary public service. Becoming a Doctor Of Veterinary Medicine will give you a lifetime of rewards. That’s my story for today. 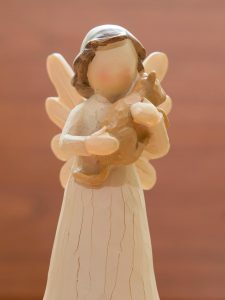 Take a look at my Cat Care Products page for something you might want to give your special kitty for Christmas. Now do something green for the environment and have a wonderful day. If you have any questions or comments please do so below. Here are a couple of books from Amazon for more information. Please click on the image for pricing and access to other books.